Your donation today helps ensure a healthier tomorrow for the kids in our care. Every day a child spends in the hospital is another day away from friends, from big brothers and from little sisters. It's stressful. It's lonely. They just want things to go back to normal. When you join our Day to Donate campaign, you play an important role in making 'back to normal' possible. Join Rady Children’s Auxiliary, schools, businesses and community groups for Day to Donate on Tuesday, December 3. 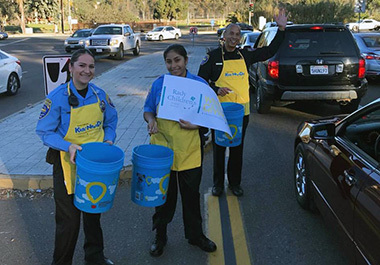 Champions for the kids will take to street corners and local businesses with blue buckets and aprons to raise funds for the kids at Rady Children’s. For more information, please call 858-966-5887. Rady Children’s Hospital Auxiliary is committed to supporting Rady Children’s programs and services that depend heavily on philanthropic support. The proceeds of your contributions to Day to Donate support patient care programs, state-of-the-art technology and lifesaving research projects as recommended by the Auxiliary Board of Directors.